This quote is by Bil Keane, who was a famous American cartoonist. If you are interested, you can see some of his famous ‘family circle’ cartoons and read more about him here. 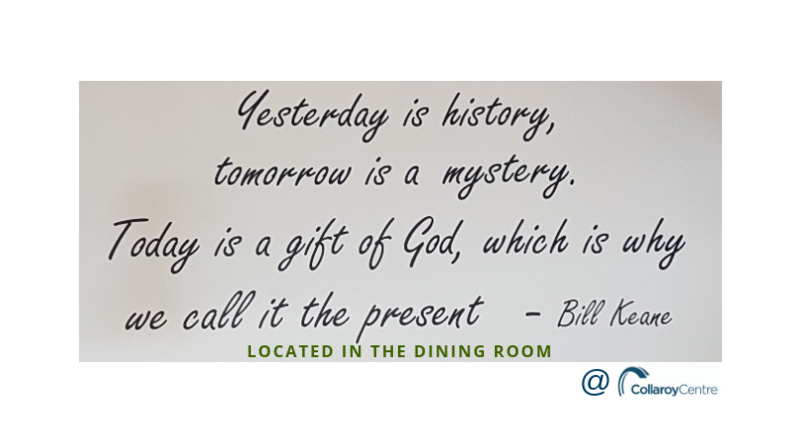 We chose Bil Keane’s quote for our wall because we thought it was fun and not too serious, but none the less makes a wise point about life. You can’t change what’s past, you don’t always know what’s coming, so focus on the present. If you think about it, every day is a once-in-a-lifetime opportunity. There is no point in spending your life saying ‘I wish I’d done this’ or ‘one day I’ll do that’. If you want your life to be different, start now! Sometimes days can feel like a ‘gift’ you don’t want. For some each day brings reasons to be angry, unhappy, fearful, to escape or hide away. Many of these reasons are perfectly valid, you can’t just wish them away. But you can do something about them, and that can include asking for help. At the Salvation Army we believe in helping people every way we can, it’s why we exist. We would not want you to pass through a Salvation Army property in pain or need, hating your day; and not contact someone about it. If you don’t have anyone else, contact us! If we can’t help you directly, we will help you find someone who can. Never give up hope. Every new day is a chance to start again.